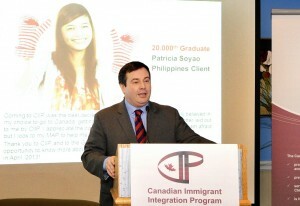 Citizenship and Immigration Canada (CIC) celebrated the 20,000th graduate of the Canadian Immigrant Integration Program (CIIP) on Tuesday, marking a milestone in its effort to improve the economic integration of new Canadians. CIIP was launched in 2010 with funding from CIC, and is managed by the Association of Community Colleges (ACCC). The program provides counselling on settlement-related issues like entering the Canadian labour market and credential recognition through foreign offices in up to 25 countries, including Philippines, China, India, and the UK to foreign nationals who have had their application for permanent residence in Canada approved and are waiting to receive their visa. The goal is to prepare these would-be immigrants so that once their visa has been finalized and they arrive in Canada, they hit the ground running and more quickly find a job and begin their career in the country. Coming to CIIP was the best decision I have ever made. Though I totally believed in my choice to go to Canada, getting there and knowing what to do was better laid out to me by CIIP. Ms. Soyao is scheduled to arrive in Canada in April. The federal government, through CIC, has invested $15 million into CIIP since 2010.